Assam saw a brutal terrorist attack today. The land which strongly repulsed Mughal forces back at the heights of Mughal power, has no option but to watch in horror as events unfold today. The fate of Assam was sealed some hundred years ago when greed took over and changed the demographics of this place forever. The area under tea plantation steadily went up beginning 1881, which quadrupled in the following five decades. The cheap labour needed for tea plantations were brought from other areas in Bengal and Bihar. The migration which was initially forced upon by the British colonial system was later endorsed by other middle class, which was convinced that no economic progress can take place without immigration (Do you hear echoes of development!!!). What made the problem worse was that most of the immigrants were poor Muslims from Bengal. If you compare columns 5 and 6 in the table above, you can immediately see that predominantly Muslims were migrating to Assam. Almost every decade saw an increase in Muslims in Assam due to immigration, since 80% of the migrants were Muslim. To completely understand the impact of immigration on Assam, the above table comes handy which gives the total percentage of immigrants in the original stock. It is an unprecedented story of mass immigration where in five decades the immigrant population rose from 5.3% in 1881 to 26.6% in 1931 i.e. in five decades. Since almost 80% of these immigrants were Muslims, this increased the stock of Muslim population by more than 20% in five decades. The history of Brahmaputra Valley for the last five decades or since Indian independence is defined by events which took place more than 100 years go. The hate for non-natives in Assam is very well justified due to the increased pressure on natural resources in the valley. This was constant problem even at the time of the first phases of immigration as Assam lacked food grains, which had to be regularly imported from other areas. The once contractual workers, who came for short duration, kept settling down thereby increasing pressure on the resources further. The modern independent India did not reverse the problem but further exacerbated the problem by allowing unhindered immigration post independence. If you look at current position of the state, Muslims are roughly 39% of the population in 2011 census, which is supposed to go below 50% in the next three to four decades. The economic greed which changed the demographics of the state some hundred years ago charted the course of collision for the next hundred years. Those who think Assam problem can be solved by development have ignored the historical reasons for the conflict, which will increasingly take religious fervour in the future. Even those who think about the idea of deporting illegal Bangladeshis only contemplate to send back those who came post 1971 i.e. after formation of Bangladesh. But will it solve the problem? Probably not. The damage was already completed in 1931. Muslims outbreeding other communities when in minority is a proven fact. So, throwing back those who immigrated into Assam after 1971, can solve the problem momentarily by buying some time. But it will only push the conflict to future as Assam will become a tinderbox again thanks to Muslim womb. 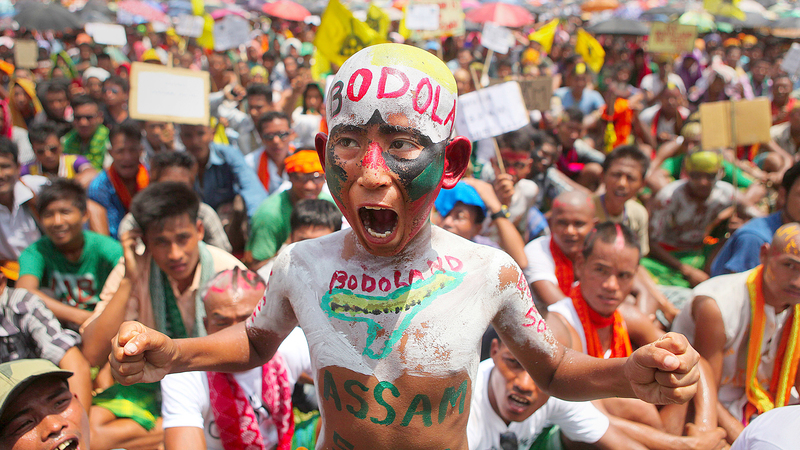 So any migrant cut-off date less than 1881 won’t change the fate of Brahmaputra Valley. The army of Aurangzeb must be laughing in its grave on how Assamese willingly/unwillingly brought their own doom after having successfully resisted the hordes of barbarians some three centuries ago!